1. To have students become familiar with the physical characteristics of beaver and to know why these are important to the beaver's way of life. 2. To have students become familiar with the beaver's habits and habitat: life cycle, food, shelter, environment. 3. To have students become aware of both the historical and present day importance to the beaver. 4. To have students become familiar with some traditional stories and beliefs about the beaver. 5. To increase oral and written language skills in English, and in the local Native language where practical. 6. To develop basic science and math skills and precepts within the local cultural setting. The selected Alaska Content Standards for Science and Math and the Cultural Standards for Students which are addressed by this unit are identified and the skills and knowledge which are expected as learning outcomes are listed under the standards. This Cultural Mini-Unit, Beaver in Interior Alaska for K-3, supplants an earlier Iditarod Area School District unit prepared for K-6 by Linda Deardorff in 1984. Many parts of this unit are borrowed from that previous unit, but in this newer version developed under the Alaska Rural Systemic Initiative, additional activities have been included to emphasize the study of math and science in the local cultural setting. The unit as used in the Iditarod Area School District is in the form of a learning kit including lesson material, reference books, puppets, tapes, beaver food and cuttings and beaver bones, teeth and pelt. The written material presented here is part of the Kit Notebook and includes the Goals of the unit, Alaska Standards addressed, and a section including learning objectives and activities for each of the first four goals. Goals five and six will be met by activities throughout the unit. A Resource List is also included and references are made to various materials within the activities. Some of the supplementary pages are reproduced here but there are many more only in the actual kit notebook. The basic unit may be covered in a two or three week period, but could be expanded to cover the whole quarter. It is suggested that this unit be presented in the spring while local people are trapping and that local elders and trappers be invited to share their experiences with the students as often as possible. There are no lesson plans as It is expected that each teacher will take the materials and information included in the unit and arrange them as best fits the specific grade level and group of students being taught. Although the unit is designed for use in the primary grades, many of the ideas and activities may be suitable for upper grades. It is suggested that the teacher begin a personal collection of beaver material. Use what is presented here to start a beaver notebook, and put together your own beaver kit. Develop your own math and science projects based in the local community. There are many more materials available than those on the resource list, many more activities and ideas you can use, but your best resources will be the people of the community, mainly the elders, who will be able to tell the students things about beaver and about the traditional way of life which they will not find in any books. 1) Students will be able to list the beaver's adaptive characteristics and to indicate how each helps the beaver to survive. 2) Students will be able to list the things necessary in an ideal beaver habitat and to give local examples of such. 3) Students will be able to give examples of the changes beaver can make in the environment. 4) Students will be able to draw/build a model beaver lodge and to describe its distinctive characteristics. 1) Students will be able to perform basic arithmetic functions, to estimate and to choose appropriate tools to solve simple problems involving beaver. 2) Students will be able to use math to calculate receipts and profits from beaver trapping, production of artifacts from beaver parts and other business transactions. 3) Students will know by experience that math is a useful tool in solving daily problems. A-4 - practice their traditional responsibilities to the surrounding environment. 1 Students will know how to treat beaver according to local custom. 2 Students will know the traditional importance of beaver in the local economy. 3 Students will know the importance of beaver in the local bioregion. 4 Students will be able to indicate on a map of the local area the places where beaver are traditionally found. Goal: To have students become familiar with the physical characteristics of the beaver and know why these are important to the beaver's way of life. 2. Students will list each of the beaver's special adaptations (split claw, clear eyelid, etc.) and its specific purpose. 3. Students will be able to tell why the beaver's physical characteristics are important to the beaver's way of life. 2. Show drawings or photographs of beaver. Show a film about beaver. Read to the class about beaver. Sections of either The Beaver or The Beaver: How He Works are suitable for this. 3. Let students examine a beaver or beaver parts (real or model) and note special features or adaptations. It will generate a lot of interest if a local trapper can bring in a beaver carcass for students to look at. 6. Demonstrate how "Oil and water don't mix!" for the students, page 1-c. Have the students prepare reports (oral or written) on this experiment. 7. Do "Let's Draw a Beaver", make a beaver puppet or do another suitable art activity emphasizing the shape and parts of a beaver (pages l-e and 1-f). Some questions to consider in introducing the topic beaver. 1) What kind of an animal is a beaver? 2) How and where do beaver live? Are there any around here? Where? 3) How do you catch a beaver? 4) How do you skin a beaver? 5) What are the different ways of stretching the skin? Why do you stretch it? 6) What are the different ways of tanning the skin? 7) What things do people make out of beaver skin? 8) What parts of the beaver do people cook and eat? 9) What other parts of the beaver do people use, and for what? 10) What are the traditional beliefs or taboos about beaver? 11) Are there traditional stories or songs about beaver? 1) What would happen if a beaver lost his tail? 2) What would happen if the beaver couldn't oil his coat? 3) What would happen if a beaver broke his tooth and it wouldn't grow again? 4) What would happen if a beaver didn't have the little flaps of skin to close behind his teeth? Experiment: Oil and water don't mix! -why beaver don't get soaking wet when they spend so much time in the water? -what keeps them from getting really cold in the icy water? The beaver has oil glands under its tail. When beaver groom themselves, they spread the oil through their fur to make it waterproof The water never gets near their skin. That's how they can stay dry and warm even in cold water. Wet fur would conduct heat away from the body. Since the fur doesn't get wet, the warmth stays in. How can the oil keep them from getting wet? Here is an experiment to show to the class how the oil keeps the beaver from getting wet. 1) Put some cooking oil in a bottle. Pour water on top and shake. Gradually the oil and water will separate and the water will sink to the bottom. Oil and water don't mix! 2) Pour some oil on a piece of construction paper so it soaks into a large area. Pour some water on top of the oil. The water will form globules or will run off. This is what happens when water touches a beaver's oiled fur. Oil and water don't mix! What shape is a BEAVER? In this simple activity you can reinforce student's knowledge of shapes. Draw on the board a circle, a larger half circle and an oval. Ask students to identify these shapes. Then have students draw these shapes on their papers and turn them into a beaver. They can also add tiny circles for eyes, little triangles for ears, and little rectangles for teeth. And don't forget to add some feet! 1) Give each student a paper bag and material to stuff it. When the bag is stuffed, fold the top over and staple it. 2) Give each student a set of head, tail, etc. Tell them to color and then cut out the parts. Tail can be lined to look like scales. Teeth should be cut out of white paper and colored orange. 3) Glue the head and both sets of feet on the front of the bag. Glue the tail on the back. Puppets can then sit up on a table or shelf or, if a hole is punched in the top of the head, can be hung by yarn to look as If they are swimming around. Students drawings of lodges, trees and a beaver pond make an effective background. Goal 2: To have students become familiar with the beaver's habits and habitat: life cycle, food, shelter, environment. NOTE: There are several pages of background information for the teacher included in this section, pages 2-b,c, d.
1. The students will describe the life cycle of the beaver. 2. The students will describe the beaver's house and how it is built. 3. The students will list and identify the types of food eaten by beaver. 4. The students will tell how a beaver's habits help protect it from enemies. 5. The students will describe beaver habitat: land form, vegetation, other animals and birds found there, etc. 6. The students will list some of the problems that occur when beaver and people live too close together and will be able to suggest some solutions. 7. Students will do simple math problems related to beaver habits and habitat. 1. Read with the class The Life Cycle of the Beaver. (see page 2-a for Study Guide.) Discuss the life cycle of the beaver. 3. Invite an elder or other community member to the class to talk about beaver. Find out where beaver live in the area and where people from the community have traditionally trapped beaver. Record this information on a map of the local area. 4. Read about what a beaver eats. Take a field trip to collect samples of beaver food. Examine the food samples you have collected. Peel off the bark and taste the different kinds of sticks. List and describe the types of food. What are the variables which might affect a beaver's diet? 5. Discuss how you would know if you were near a live beaver lodge. What signs would you look for? If possible visit a beaver lodge on a pond or river bank and have students develop their skills of observation. Look for beaver tracks and trails, beaver cuttings and trees that have been felled (How new do they look? ), a feed pile near the house and other signs that beaver are living close by. Describe what was observed and what can be inferred from the observations. 6. Brainstorm about beaver habitat; what environment does a beaver need to survive? Have students list the components of an ideal beaver habitat. 8. Build a "beaver lodge", instructions on page 2-e. In this activity students will not only learn about the construction of a lodge but also how hard beavers have to work! 9. Discuss what happens when beaver and people live too close together. List the problems and then try to suggest one or more solutions for each. Ask the elders of the community about beaver problems and solutions. If available, read Trouble in Beaver Hollow, a fictional story about how a young beaver and a young boy deal with the problem of litter in a beaver stream. Who remembers what else beaver use their back paws for? (to comb their fur.) Note: The beaver has a special split toenail on his back paw designed just for grooming. What are the beaver's enemies or predators? Hungry wolves, wolverines and bears will attack beaver on land. Otters sometimes go right into beaver lodges and attack the beaver. Hawks, owls, eagles and foxes go after the kits on land. People who want beaver for meat or fur set traps or snares or even shoot beaver. How does a beaver protect himself from enemies? Beavers are primarily nocturnal. They do most of their work at night and so are not easy to see. They build very strong lodges to keep out predators. The lodges usually have more than one tunnel. Beaver have refuge holes along the bank where they can go to rest or hide. Beaver try to stay close to the water so they can dive and swim. They build their dams to make the water deeper and safer. If a beaver senses danger, he warns others with a slap of his tail. How does a beaver survive the cold Alaskan winter? Beaver store lots of branches in feed piles under the water close to their lodge so they can swim to these under the ice. Beaver can breathe in their lodges because there is always a small air hole at the top. When they are in the water there is a layer of air under the ice where they can breathe. Beaver lodges are very thick and strong and can keep out the cold. The beaver has very warm fur which he keeps oiled. Beaver have a greater effect on their environment than most animals. When they move into a new area they can cause drastic changes. In the same way, if a beaver dam is broken and can't be fixed or the beaver decide for some reason to leave the area, once again there is a great change over the following years. When beaver live in inhabited areas they can do a lot of good, but also a lot of damage as they work to change the environment. Why do the beaver build dams? - to hide the entrance tunnels to the lodge. - to store their food. - to dive into to protect themselves from predators. What happens to the surrounding area when a beaver builds a dam? The water spreads out and the surrounding area is flooded. Existing trees and other vegetation will die but new types of vegetation will grow. A large area around the pond may become marshy. New birds and animals will move into the area. What other creatures live around a beaver pond? birds: ducks, swans, snipes, etc. What happens if the dam is broken and the pond drains? The change will be much more gradual than when the dam was built. Slowly the pond will become smaller and shallower and different animals will live there. The surrounding area which was only marshy will dry out and the forest will start to move in. Eventually where the pond was will be a grassy meadow or a patch of willows. If the pond was built by damming a stream, the stream may still run through the area. What happens when beaver live too close to people? Sometimes beaver do a lot of good. Their dams help conserve water, stop erosion and prevent Hoods. The ponds that they form help other wildlife survive. 1) Dams flood cropland and pasture, roads, railway tracks. 2) Hungry beaver can destroy orchards, tree farms and nurseries and even get into people's gardens. 3) Occasionally a tree felled by a beaver will smash a roof or power lines. 4) In rural areas where people get their water from a pond or creek they may catch giardia or "beaver fever"
HABITAT PROJECT: Have students make a set of drawings (murals?) to show an area 1) before the beaver come, 2) while the beaver live there, 3) long after the beaver have gone. If you are doing this project with young students, the platform will need to be built ahead of time. It might make a good shop project for high school students. The following is only meant to be a guide. Use your imagination! Parents can be asked to take their students out to gather willows and deliver them to the school the week before the lodge is to be built. If the platform is well built it can be stored and used year after year or you may want to leave the whole structure up for a while. If it is inside it can be used as a reading corner, or if It is outside it could serve as a "playhouse" for students. 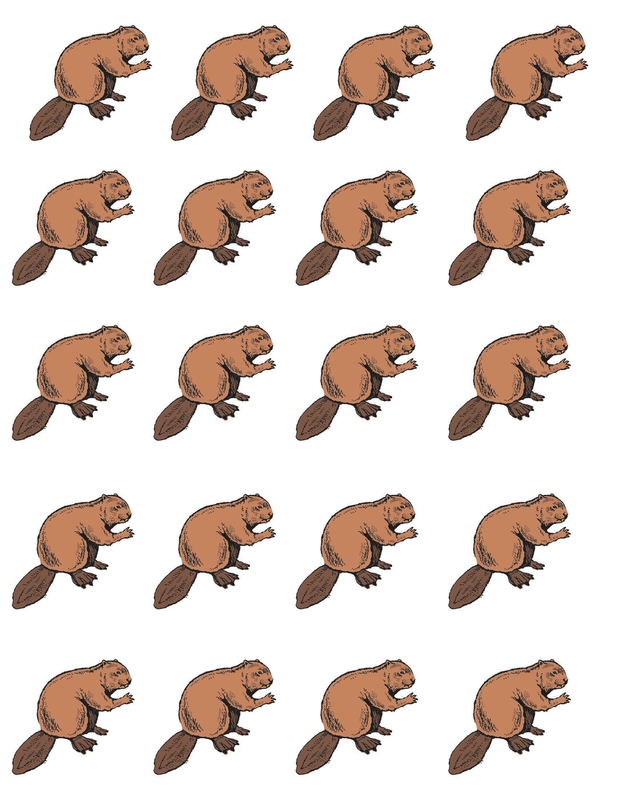 1) How many beaver is too many? Presume that a pair of beaver have four surviving young each year for four years. What if the young ones stayed with their parents and didn't leave when they were two years old? How many beaver would live in the house after four years? Why don't all the beaver remain in the same house or even in the same pond? What would probably happen if they did? 2) How long can you hold your breath? Did you ever wonder how a beaver can stay under the water so long? Beaver can swim for up to half a mile underwater. Usually beaver only stay under water for two or three minutes but can last up to 15 minutes if they have to. When a beaver dives under water its heartbeat and circulation slow down. That means it needs less oxygen and its breath can last longer. Tell your students to try this! First of all estimate how long you think you can hold a breath. Write the estimate down on a piece of paper. Then take a deep breath and hold it as long as you can. Let it out slowly, but don't take in any more air. Watch the second hand on the clock. How long can you last? The average person can hold his breath only about 15-20 seconds. Make a graph to show how long the students can hold their breath compared to a beaver. 3) How deep is the water? It is said that beavers need at least 3 feet of water in their pond all year round to survive. a) If the water level of the pond drops 1 foot in winter when It freezes, how deep would the water have to be in summer? b) If the floor of the lodge is 1 foot above the level of the water in summer, how far above the water will it be in winter? c) If the water is 6 ft. deep at one end of a pond and 2 feet deeper at the lodge, how deep is it around the lodge? 4) How far does Buddy Beaver swim? Buddy Beaver is having a busy morning. He is out very early while it is still dark and is helping repair the beaver dam. He swims from his house to the shore and cuts down a small birch tree. Then he pulls it through the water to the dam where Big Beaver uses it to help plug one of the holes. Buddy swims back and gets another little log, and then back again to the dam. Now he is hungry so he swims to a patch of willows on the other side of the pond. After he eats he sees that the sun is already up so he goes back to his house to take a nap. a) Look at the picture and figure out how far Buddy swam this morning. b) If Buddy made three trips back to get logs for the dam and then went straight home, how far would he have to swim? Goal: To have students become aware of both the historical and present day importance of beaver. 1. Students will know why the beaver was an important animal for the Native people of Alaska. 2. Students will describe the historical importance of the beaver in the opening of the West and North in the 19th and early 20th century. 3. Students will list several important uses of beaver today. 4. Students will be familiar with various methods of catching beaver, and with how the skins are prepared for use or for market. 5. Students will do simple math problems dealing with the use and marketing of beaver. 2. Read the introduction to The Beaver, pages 4-7. Discuss why the beaver was of such importance in the early history of our country. Were beaver of the same importance in the opening of the interior of Alaska? Were there any early trading posts in your area? How is beaver used today? Does it still have the same importance? 4. Invite an elder or other community member to come to class and talk about beaver trapping. Have students prepare some questions ahead of time. 5. Have students list ways beaver can be caught. Examine a snare and a trap. 6. Discuss ways of preparing beaver meat. Cook and eat some beaver. 7. Review drying and tanning methods. Compare commercially tanned skins with home tanned. Look at Items made with beaver fur. 8. Do the "BEAVER PUZZLERS" starting on page 3-b. Skins used to be cut in strips and woven or braided to make blankets. Beaver meat can be boiled or roasted. Beaver feet can be boiled or pickled. Beaver tail can be boiled or roasted. The head, feet and tail and be boiled and cleaned to make "beaver cheese". Traditionally beaver teeth were made into chisels and draw knives for working on wood. Beaver teeth can be decorated with beads and hung on the wall. Beaver feet can be skinned and the skin made into a little bag. Beaver castors are used for bait for trapping. Certain beaver bones were used to test a person's strength. Beaver claws were sometimes made into necklaces. The size of a beaver pelt is determined by adding together the number of inches across the pelt from top to bottom and from side to side. Information from Beaver Trapping by C. Wulf. Look at the sizing chart and the list of prices. Answer the questions. John caught three beaver. After he stretched and dried them, he measured them. How much could he sell his beaver pelts for? b) Billy also got three beaver. After he stretched and dried them, he measured them. c) Who earned more money, Billy or John? How much more? d) Borrow some stretched beaver pelts. Measure them. What size are they? Suzy likes to sew. She has some skins she tanned from beaver her husband trapped for food. Now she wants to make some hats to sell. She wonders how much profit she would make on each hat. Help her figure it out. a) If she sells the hat for $250.00, how much profit is she making? b) If she had to buy the beaver skin for $30 and pay $30 to have it tanned and the other expenses were the same, how much profit would she make? Even if Suzy makes a very small profit on the sale of a hat, why do you think it would still be worthwhile for her to make and sell hats? What else could she do with the skins she has tanned? 3) What Is a Beaver Worth? Charlie had been told by his elders that when you catch an animal, nothing is ever wasted. He got a beaver and wondered how many things he could make out of it. He also wondered how much money he could get out of one beaver. Charlie boiled the beaver head and took out the teeth which he sold to Auntie Alice for $3.00. She was always trying to get beaver teeth to use in making ornaments for people to buy and hang on the wall. a) How much money did Charlie make from his beaver? b) If it cost him $12.00 for gas to trap one beaver, how much profit did he make? c) Can you think of other things he could have done to make more money from that one beaver? Goal: To have students become familiar with some traditional stories and beliefs about beaver. 1. Students will know that in many cultures it is believed that long ago animals were people and could change back and forth and that many of their present characteristics came from things that happened to them at that time. 2. Students will retell one traditional story about the beaver. 3. Students will know why it is important to have respect for animals, and how that respect is shown for the beaver. 4. Students will relate several traditional beliefs about beaver. 1. Read Animal People or a similar story to the class to introduce students to the idea that long ago animals could take human form and that many of their present characteristics come from things that happened then. 2. There are several types of traditional beliefs about beaver. As with other animals their signs could be read to foretell weather or some coming event. There were also beliefs about how you should treat beaver, or what will happen if you show disrespect. Read "Beavers" from Old Beliefs - Upper Kobuk, pg. 4-a. This is not from interior Alaska but is a good introduction to a discussion of local beliefs. Also look at the "Beavers" page from Beliefs from Nikolai, pg. 4-b. 3. Invite an elder to class to tell a traditional story about beaver and some of the traditional beliefs. Ask them if there are any special ways that beaver should be treated. Another good story: "How the Beaver Got His Tail" Is found In How Stories of Alaska. 5. Have students write their own story about how the beaver got one of his distinguishing physical characteristics. We trap beaver for food and for clothing. They are also very useful in preventing floods when the spring thaw comes. The following are some of our beliefs about them. 1. If someone is out trapping for beavers, he must be sure not to use ugruk, bearded seal, or seal ropes. If he does, he will never get a beaver. 2. After someone catches a beaver, he must take off the little thin bones on the sides of the feet and throw them away. He must also remove the overlapping toenails and throw them away. Only after he does this can he go home. He does this to make sure that he will be able to catch beavers more easily on his next trapping trip. 3. Whenever a beaver is eaten, all its bones must be thrown back into the water from which it came. This is done in order to make sure that the spirit of the beaver is returned to its place. It is the only thing to do in order to catch beavers more easily in the next trapping trip. If the beaver built a small house and stored little food, a short winter was expected. If he built an extra big house, a long winter was coming. NOTE There are many versions of this story told all over Alaska. They tell how Grandma porcupine wanted to get across the river and was finally taken by beaver. In this version the fire she makes leaves a permanent mark on beaver's tail. Porcupine was walking up and down the river bank. Every once in a while she would stand up and stare across the river and sniff the breeze that blew from the other side. Porcupine was on an island. "Oh, if I only could get to the other side of the river. But I'm too old and fat. I would never make it." porcupine thought. She curled up into a ball because her stomach hurt so bad, and started to cry. "Why porcupine! Why are you crying on such a beautiful day?" asked muskrat. "Well porcupine I could take you: across, just hop on my tail." said muskrat. "Oh, muskrat could you?" Porcupine asked and wiped away her tears with her paws. Then she wobbled over to pick up her cooking pot and sticks. She returned and was about to perch on muskrat's tail. "Why muskrat? I can't sit on your tail it's as skinny as a rope I'd fall off and drown!" "Rope! You call my tail a rope? Well you can stay here then," and off he swam down the river. Porcupine crumbled to the ground. She started crying again. Whistle! What was that? Again whistle! Slowly she lifted her head and was staring into the eyes of mink. "Why porcupine! Why are you crying on such a beautiful day as this?" asked Mink. Porcupine stood up and looked. It was mink swimming along the flyer. As he swam toward her porcupine said, "Oh, mink I can't get to the other side 6f the river. I'm so hungry, I've eaten' all the bark and leaves from the trees and I can't swim." "Well porcupine I could take you across. Just hop on my tail" said mink. Porcupine remembered muskrat's tail. She looked down and said, "Why mink! Your tail is as skinny as a willow! I can't ride on your tail." "Willow! You call my tail a willow? Well you can stay here then," and off he swam down the river. Porcupine crumpled to the ground again and started crying. Whistle! What was that? Again whistle! Slowly she lifted her head and was staring into the eyes of otter. "Why are you feeling so down porcupine?" asked otter. At which porcupine sobbed even louder. "Nothing could be that bad!" said otter. "I cannot get to the other side of the river. I have nothing to eat over here," said porcupine. "Well hop on my tail and I'll bring you over. Porcupine remembered mink's tail. She looked down. "Why otter! Your tail is as skinny as a stovepoker." "Stovepoker? You call my tail a stovepoker! Well you can just stay her then," and off he swam down the river. By now porcupine was really feeling hungry. She went over to her cooking pot and licked the inside, there was nothing. Her stomach started growling and cramping it hurt so bad. She curled into a ball and rocked back and forth. All of a sudden, slap! Oh, no what was that? Porcupine curled up even tighter. I hope it's not going to eat me she thought. Slap! again. "PO-PO-porcupine! How come you-your crying?" asked Beaver. Slowly porcupine looked up. It was beaver. He had been swimming along the river when he noticed porcupine all curled up. "Oh, beaver I'm so hungry! And I can't swim to the other side. I'm too old and fat. Beaver just look up here, do you see anything for me to eat?" asked porcupine. Beaver stood on his hind legs and looked, he couldn't see anything, for he was nearsighted. "W-w-well just get on my tail, I'd be h-h-happy to take you over" said beaver. She went to look at his tail. "Oh Beaver! Thank you, thank you!" Porcupine grabbed her cooking pot and sticks and sat on beaver's tail and away they went. Porcupine was so happy! Hmm, hmm. hummed porcupine. The closer they got to the other side, she thought to herself, "Oh, I'd better start my water so it will be ready when we reach the other side and all I have to do is gather bark. Yes, broth, that's what I need.' First she got a bucket of water, and then made a fire on beaver's tail. Hmm, hmm. hummed porcupine. All of a sudden beaver slaps his tail! Porcupine fell into the water! Cooking pot and all. "B-b-beaver! There's water in my ears," said porcupine. "Well cover your ears!" said beaver. "B-b-beaver! There's water in my eyes," said porcupine. "Well close your eyes!" said beaver. And down to the bottom of the river she sank. She started climbing through weeds and over logs and rocks. Finally she reached the shore choking and coughing. "Why did you slap your tail? I could have drowned!" asked Porcupine. "Well why did you - start a fire on my tail?" asked beaver and away he swam down river. Porcupine shook herself and started up the bank, she sniffed the air. "Why, I'm on the other side of the river," she thought. And to this day when you look at beaver's tail you'll see a dark spot in the middle of his tail, where porcupine had started the fire. There was a time when both Beaver and Porcupine were afraid of Bear. Then, one day, Bear started chasing Porcupine. Porcupine climbed a big spruce tree. Bear climbed up after him. Porcupine climbed higher and higher. So did Bear. Porcupine climbed way up into the tippy top of that tree. So did Bear. Now he could catch Porcupine. Bear reached out his paw to grab Porcupine. Porcupine slapped Bear's paw. Now it was full of quills. Quickly, Porcupine swung his tail again. Bear reached up with his other paw so that Porcupine would not slap him in the face. But now Bear was not holding on. He fell out of the tree. Bear fell down, down, down to the ground. He landed on his head and broke his neck. He died. Word spread about how Porcupine had killed Bear. It was in the middle part of Alaska, the Interior where the Athabascan people live, that Porcupine killed Bear. Word spread to the West and North coast of Alaska, by the Bering Sea and the Arctic Ocean, where the Eskimos live. Now bears living there were afraid of porcupines, too. Word spread to the Alaska Peninsula and onto Kodiak Island. Now all those bears were afraid of porcupines. Word spread clear down to Southeast Alaska, that strip of land that looks like a pan handle. That is where the Tlingit people live. That is where this part of the story takes place. Now in those days, Beaver and Porcupine were best friends. They were a lot alike. They were both rodents with great big incisor teeth. With those big front teeth, they ate the same kind of things. They both used their tails when they were in danger. But in some ways, they were not the same. Beaver was afraid of Bear and Porcupine was not. Only Porcupine could climb trees. Only Beaver could swim. One day, Porcupine and Beaver were out in the forest together. They were munching on tasty twigs and leaves and bark. They saw Bear coming down the mountain. "Oh, no. Oh, no!" cried Beaver. This is the end of me. Bear will eat me for sure." "Don't worry," said Porcupine. "I will protect you. I will slap Bear with my quills." "Bear will go around you to get me. Oh, what will I do? I am too far from my lodge in the pond to hide there." "Then climb a tree." said Porcupine. "You know I can't climb trees," said Beaver. "Then I will help you," sighed Porcupine. Somehow, Porcupine pushed Beaver up in a cottonwood tree. It was hard to do. Then he started back down. "Friend, where are you going?" called Beaver. "I am going to finish my lunch," said Porcupine. "But how will I get down?" asked Beaver. "Getting down is easy. You can slide or you can jump." Said Porcupine. Porcupine waddled off. Beaver did not want to slide down. He did not want to jump down. He was afraid he would get hurt. Bear was far away now. Beaver wanted to get down. Beaver started calling, "Help! Somebody! Please get me down!" Beaver called for a long, long time. Nobody came. He started to eat all the branches he could reach. Soon the tree was bare all around him. He was out of food. He began to call for help again. No one came. He was beginning to think he would be stuck there and starve to death. Then Squirrel came. "I'll help you," said Squirrel. "How can you help me?" asked Beaver. "You are much too small." "You start sliding down. I will hold onto your tail with my teeth. 1 will hold onto the tree with the claws on my four paws. I will not let you fall." "I don't think it will work," said Beaver. "Would you rather starve to death?" asked Squirrel. Beaver decided to go down. Squirrel helped him. When Beaver slid down, he made deep grooves in the smooth bark of the cottonwood tree. Beaver scurried back to his pond-. He swam and swam and swam. He was very glad to be back. Later that day Beaver saw Porcupine walking by the pond. "Come and visit me," Beaver called to Porcupine. "You know I cannot swim," said Porcupine. "I will help you," said Beaver. "Just put your head on my tail and hang on. I won't let you get wet. I have all kinds of yummy things for you to eat at my house." Porcupine liked yummy things to eat so Porcupine put his head on Beaver's tail and hung on. Beaver started swimming. Then he started diving. He dived again and again. Porcupine hated getting wet. When Beaver came up, Porcupine would yell, "Stop! Stop that! Stop diving! You'll drown me!" Beaver acted like he didn't hear. He kept diving. Porcupine could not swim. He had to hang onto Beaver's tail. If he let go, he would drown. Beaver took Porcupine to an island and left him there. The island was not Beaver's home. There was nothing to eat there. Now Porcupine started calling. "Help! Somebody! Please get me out of here!" Porcupine called for a long, long time. He was beginning to think he would be stuck there and starve to death. Then Wolverine came. Wolverine made the cold North wind blow. The pond froze over and Porcupine walked to shore. After that, Beaver and Porcupine stopped being friends. And so it is, to this day, that Beaver and Porcupine still are not friends. And also, to this day, Bear is still afraid of Porcupine and Beaver is still afraid of Bear. And the cottonwood tree still has deep, deep grooves in its bark. There is a Koyukon story that the old people used to tell to their grandchildren on winter nights, when all the children were warm between fur blankets. The fire in the middle of the winter sod house would be burning low and the smell of the smoke would blend with the smell of fresh spruce boughs covering the floor. A young man was coming home from a hunting trip late one winter day. He had been walking through deep snow all day and was very tired, but decided to keep walking until he got back to camp. He walked and walked, but didn't see any of the familiar signs of home. He suddenly realized that he was lost. It was dark by now, but he kept walking, hoping that he would find the camp of another band. Then, he saw a fire through the trees There was a camp ahead, next to a lake. He started running toward it, and when he got to the camp, was happy to see people, at last! The man was greeted by the people. They told him that though they looked like people to him, they were really beavers He had strayed out of human territory and into beaver land. The young man was very tired. He looked around at the beavers' camp. He saw a pretty young woman next to one of the houses. Although he knew she was really a beaver, he decided to take her as his wife and to stay in the beaver camp. He lived there all winter long, with his new wife and her relatives. When spring came, the young man knew that it was time to go back to his own home. But springtime is the time of hunger, and the beavers had no extra food to send with the young man for his trip home. The beaver-people talked it over. They could not give the man food from their caches, but they decided they would let him take one of their children as food for his trip. The young man's wife offered to be killed. She would become food for her husband and keep him alive. Her parents looked at their son-in-law and said to him. "When you have finished with the meat, you must throw the bones into the water, and say 'Tonon Litseey'." This means "be made again in the water". The young man agreed, and set off for his home village with the beaver meat. The man got home safely, thanks to the meat he had been given. When he had eaten it all, he threw the bones into the water and said, "Tonon Litseey. Suddenly the female beaver who had been his wife appeared in the water where he had thrown the bones. She swam away to her parents lodge. The old people would end their story by saying, "And ever since that time, we have followed the custom of throwing beaver bones into the water after we have eaten the meat." This story was originally told by Mrs. Martha Taylor, Dawson City, Yukon Territory, Canada and is found in the book The Yukon by Richard Matthews. One time long ago, Beaver Man he's traveling around, a-traveling and a-traveling. The sun he was real hot, and Beaver-Man he got thirsty, you know, real thirsty like when you don't get even spit to swallow. He need something to drink real bad. One man he's a-traveling with, he fall down dead he so thirsty. Beaver-Man pretty soon he say to himself, "What I going to do?" And he start thinking, and pretty soon he say to the people he's a traveling with, "I going to make you some water so you better get ready to drink." Then Wolverine say, "There's no water. How you going to make some?" and they all get mad at him, think he's crazy, just want to make big show. Especially Wolverine, he's real mad. Beaver-Man he take and cut willow stick and he tie willow stick to his walking stick with a piece of... how you say in English?.. that string you make from caribou. Then he go down in a little valley, at the top end of it, and he say again, "I going to make you some water, so you better get ready to drink." Then he stick willow stick into ground. Pretty soon lot of water coming out. Lot of, lot of water from good clean spring. All these people with Beaver-Man, even Wolverine, they so happy they put their whole head right in the water. After that each time Beaver-Man and his people they get thirsty, he go up to top of little valley, stick in willow stick, and water come out. Lot of water. He done this many times. Each spring it make a stream, and after long, long time these streams so many they big enough to make Yukon. All that, it happens long time ago. That' s the end of the story. I just wanted to write and say thanks for your Lesson plans. I run science workshops Cree students in Northern Quebec. The beaver workshop was a great way to use knowledge the kids already had to present curriculum concepts like ecology and physical adaptation. The kids are surprised at how much science they already know. At the beginning of the lesson I pass around a beaver skull (left over from a feast) since the students really like concrete, hands-on stuff. 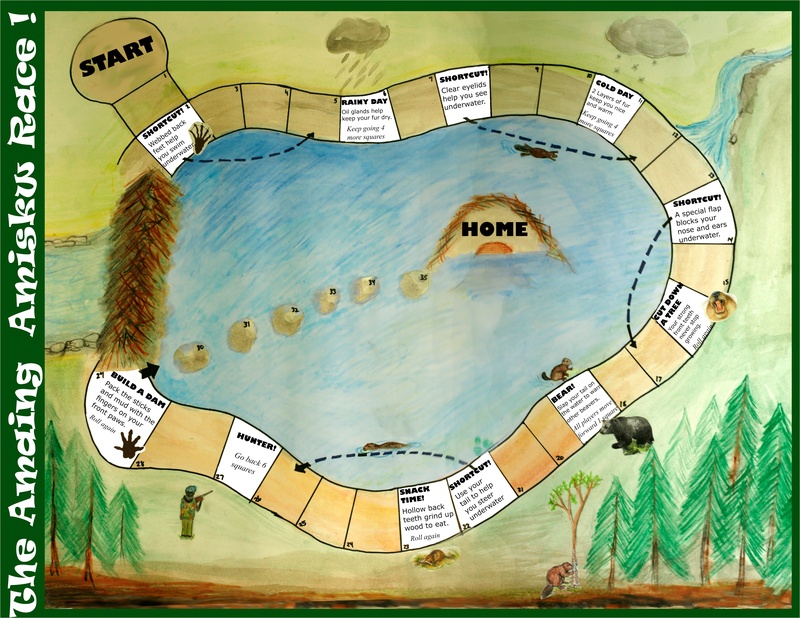 I also made a board game about beaver adaptations which you can use if you like ([board game and tokens]). It can be printed on two 11x17 pages I found that the lesson worked well with grades 4-7. Amiskw is the Cree word for beaver.